New Voices to Reduce, Reuse and Recycle! 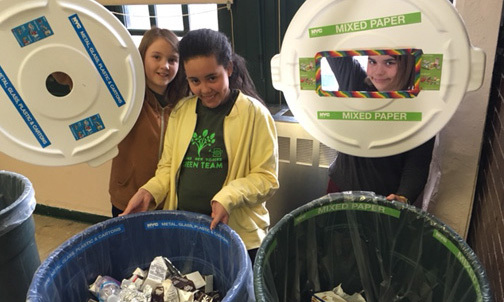 The Recycling Champions Program is singing praises to MS 443K New Voices School of Academic & Creative Arts students. 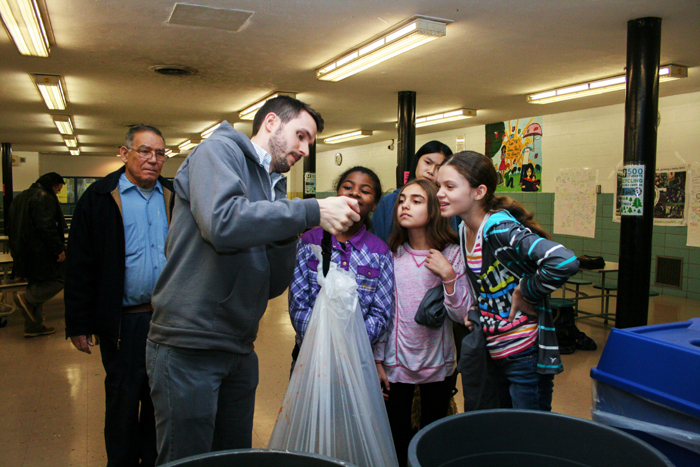 The New Voices Green Team hosted a recycling and compost assembly program as part of their 1st organics collection and recycling program in the cafeteria. Later that day all 537 students created only 2 small bags of trash during lunch; everything else was recycled and composted! Created by the NV Green Team students and Amy Musick, Chorus Teacher and Sustainability Coordinator, thier lively presentation incorporated video, music and live performance. And the results speak for themselves! 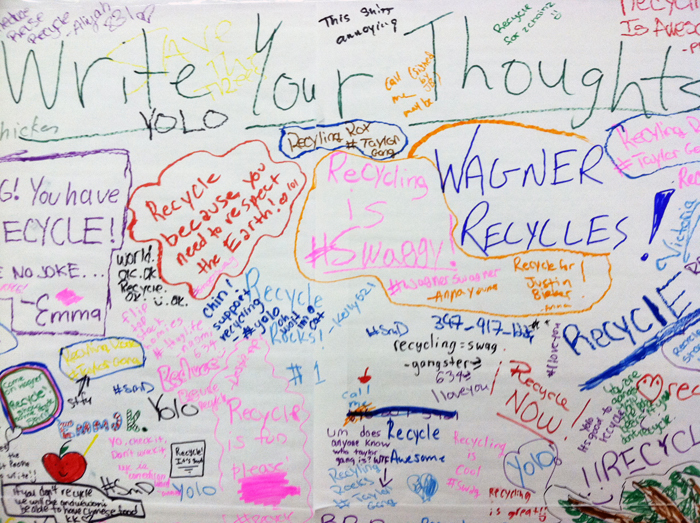 Read more about New Voices to Reduce, Reuse and Recycle! 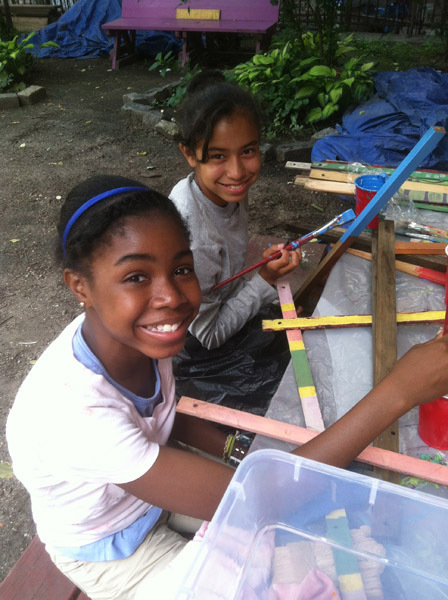 GrowNYC's Environmental Education program engages New York City school children across the five boroughs with curriculum on renewable energy, habitat restoration, water health, and green design. One of our office's most successful interdisciplinary activities has been building solar ovens from used pizza boxes. The project is both fun and educational and is for kids from upper elementary school through high school. Our lesson plan, available for free download below, guides teachers and youth leaders through the process of introducing key Earth Science concepts to their students while they engage youth in building working pizza box solar ovens. Download a PDF of our 11-page unit Solar Ovens and Earth Science. 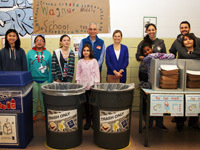 GrowNYC formed a partnership with Wagner Middle School in Manhattan called Healthy Kids, Healthy Schools, funded by NYC Council Member Jessica Lappin. 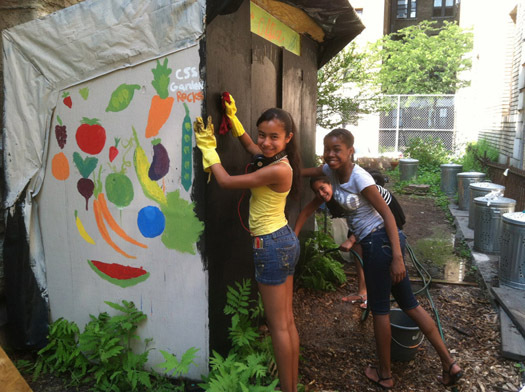 Under one roof, we are providing support from five GrowNYC programs: Learn It Grow It Eat It, Grow to Learn School Gardens, Greenmarket Youth Education, Recycling Champions and Environmental Education. 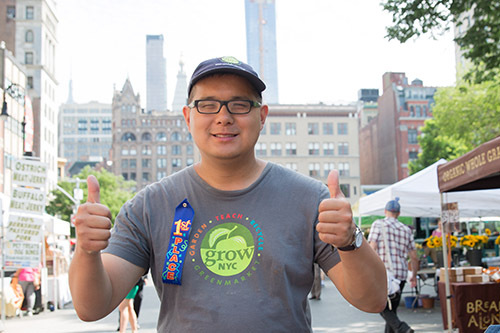 For an entire year, GrowNYC staff is educating young people about how to lead lives that improve their personal health and that of the environment around them; so that eating, growing, learning and going green become second nature. 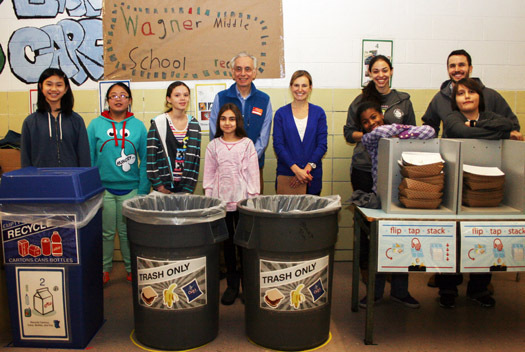 On the recycling front, we recently helped Wagner launch a school-wide cafeteria recycling program – 1,200 students in grades 6-8 sorted everything from trays to milk cartons, placing them in their proper containers with help from dozens of student volunteers and Green Team members. 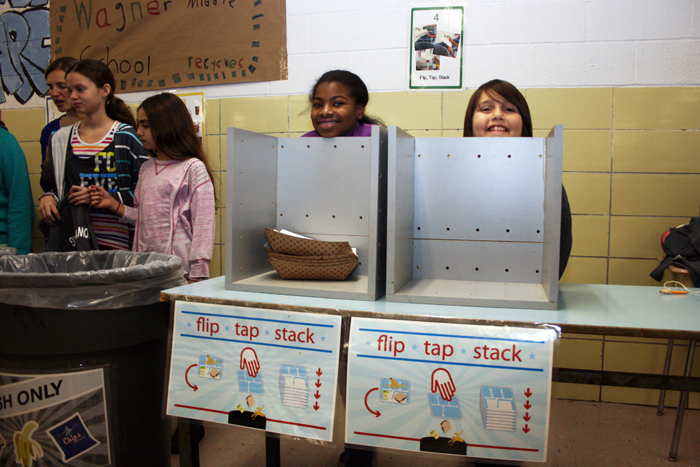 1,200 students recycling milk cartons for one year will save 31 trees! To keep it fun, grades are competing to see who can reduce their overall waste – on a weekly basis, the amount of waste will be calculated and the winning grade announced on Fridays. At the end of every month, the grade that has reduced waste and recycled the most will receive special “Out-Lunch” privileges. 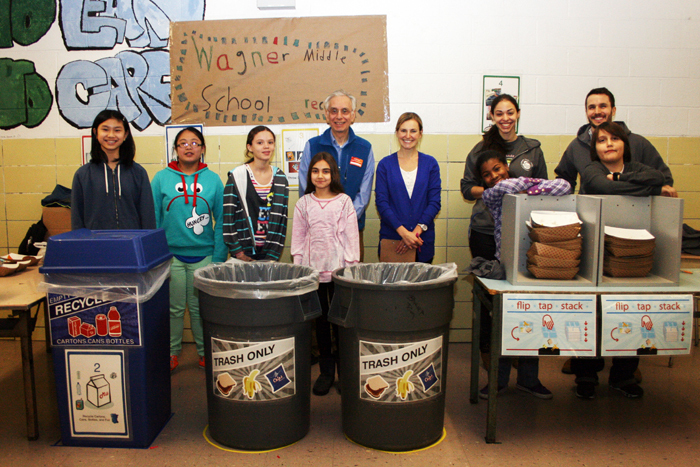 Wagner has averaged a daily reduction of 9 bags of garbage or 17%, while generating an extra bag of recyclables. 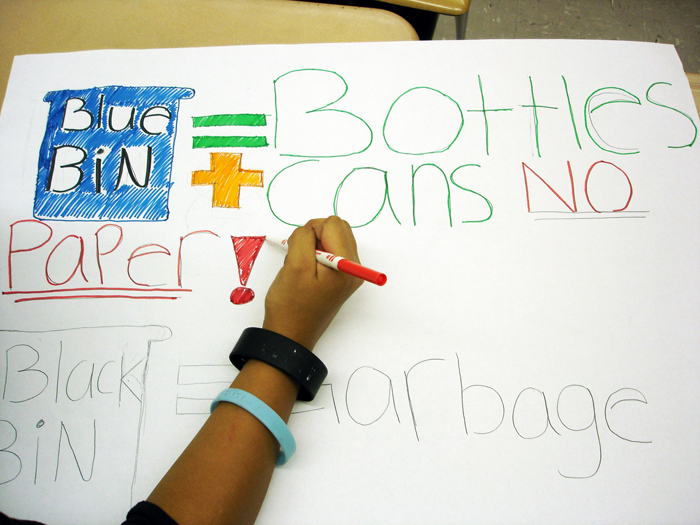 The contest, designed by the Green Team, was the culmination of an outreach campaign they undertook to educate their classmates. Working with their advisor, teacher and sustainability coordinator Jessica Gordon, students created posters, morning announcements, and a PowerPoint. The success of the program could not have been possible without the support and help of Wagner’s administration and staff. 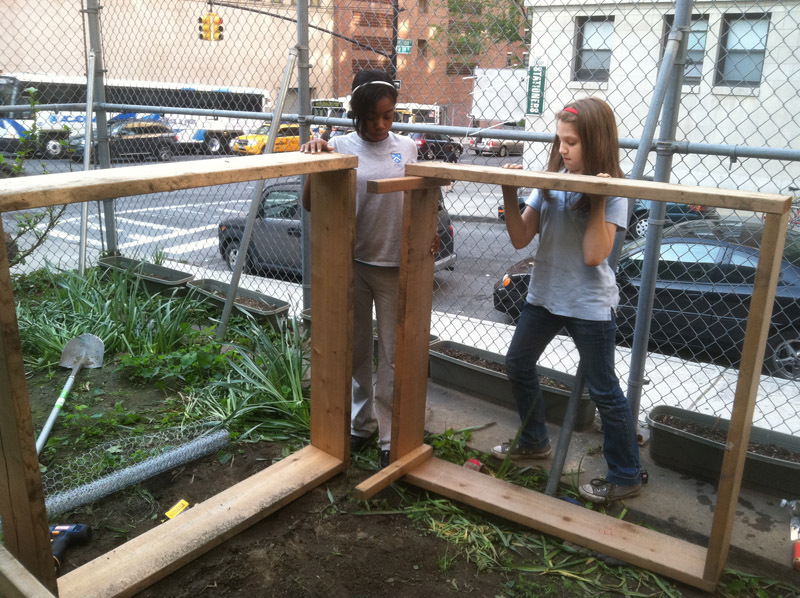 Grow to Learn NYC: the Citywide School Gardens Initiative was established in 2010 as a public-private partnership between GrowNYC, The Mayor’s Fund, and several government agency partners. 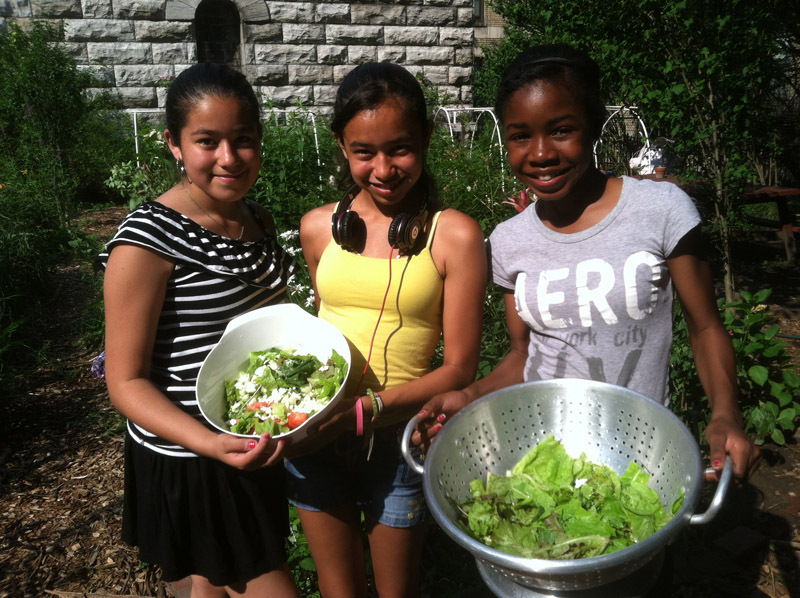 Grow to Learn profiles successful school gardens in their monthly newsletter The School Gardens Beet. The September profile appears below. It was a week before the school year officially began yet Columbia Secondary School for Math, Science & Engineering (CSS-MSE)’s garden was blooming with activity as students planted pollinator-attracting perennials, filled beds with soil, weeded, added trellis lines to tomato plants, turned the compost, and painted. Abby (13), Ashley (12), and Ariana (11) led me around their garden, expertly identifying their crops and generously offering me tastes along the way. Constructed by students practicing their engineering skills, the raised beds were lined with plastic and chicken wire to dissuade animals from burrowing inside. As we moved on, some unique and colorful structures caught my eye. The garden has two rainwater barrels painted as a chicken and a pig, and a large brightly-painted wooden shed. The front is painted with chalkboard paint where students list their garden to-dos and create temporary works of art. Ashley pointed out the different tools and supplies in the shed, but was particularly proud of the supply of extra work boots in case a student isn’t wearing proper footwear. 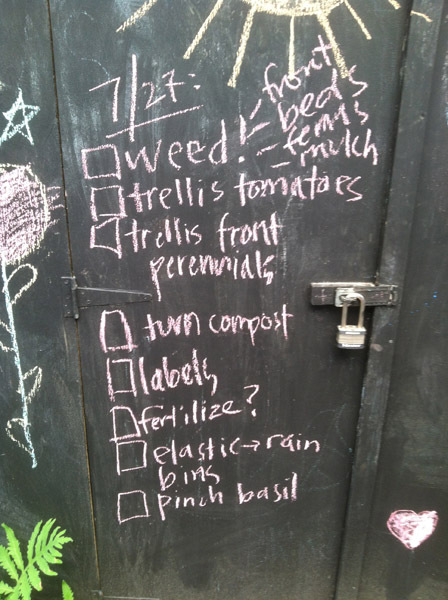 Abby was also proud to point out the garden’s six compost bins and their contents. Abby’s dad built the garden’s most recent addition: the compost tumbler. Made out of salvaged materials, it includes engineering that will enable them to harvest natural gas from the compost! Using student recipes and ideas, they plan to use the gas for cooking in the garden, an activity that the students enthusiastically lead from prep to feast. 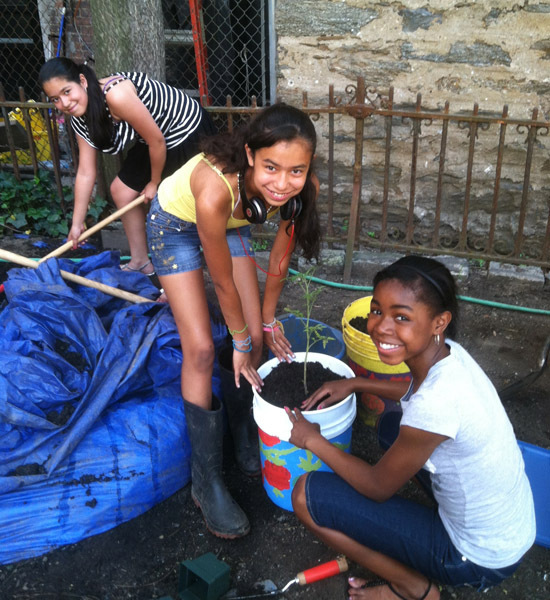 What were these students doing in the garden during their summer vacation? 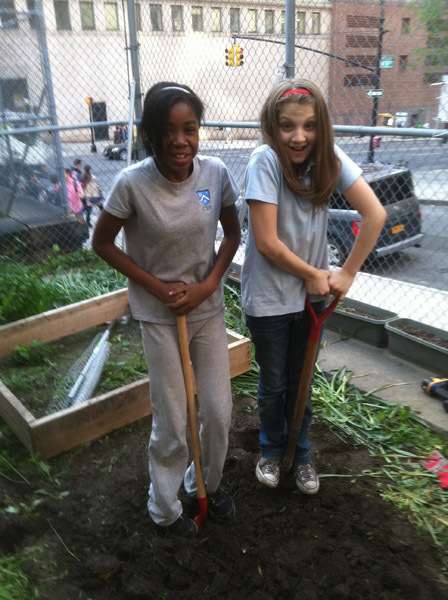 Ariana expressed that she likes to plant and “growing different types of plants and vegetables is cool.” Ashley loves the garden, it is “a place for me and my friends to gather while helping the environment and still have fun.” Abby agreed and added that being in the garden “is a chance to get away from the city.” Behind the students’ love for the garden is a dedicated and inspirational teacher, Meredith Hill. 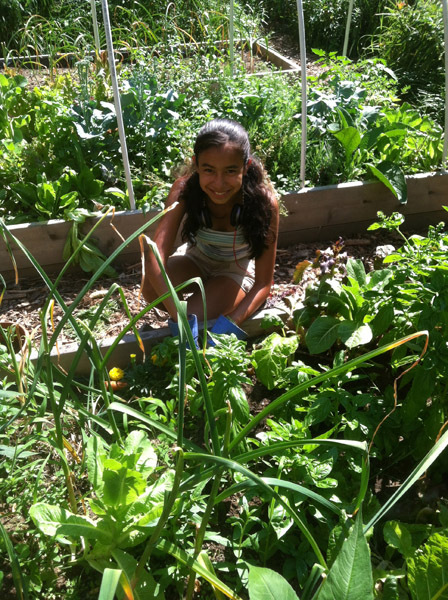 Meredith’s goal is to make the garden as student-driven as possible. During the month of June, students participate in an elective course focusing on one topic. Abby and Ashley joined Meredith and 30 other classmates in the garden for a Food and Sustainability course where they learned garden care, compost, raised bed construction, and how to prepare meals using produce from the garden, choosing what to plant and cook. The course culminated in the publication of Fresh!, a student-authored anthology created entirely by the 7th grade Food and Sustainability Class and features some of our favorite GreenThumb school gardeners. 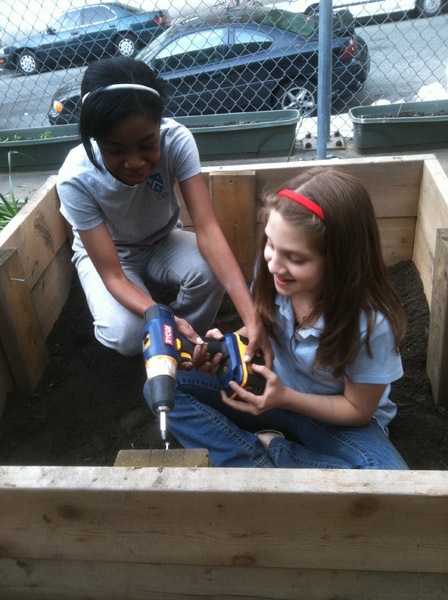 Students teach skills that they learn to fellow gardeners and the rest of the school community. From Garden to Café harvest events incorporating garden produce into the menu to collecting food waste for composting, the school gardeners have a big presence during lunch at CSS-MSE. Following a student suggestion, the School Food Director allowed students to harvest, prepare and add fresh veggies to pizza as well as distribute samples of garden produce from tomatoes to kale chips. To keep the students’ interest and excitement—and the garden—maintained, Meredith introduced open garden hours during the summer. Students were able to choose their level of involvement with the garden and it provides a chance for students who were not in her class to dig in and help. CSS-MSE’s gardening successes didn’t come without challenges. After two years of having a rooftop garden, new regulations made them unable to use the space. Meredith explained, “I started looking for spaces elsewhere to garden, and a colleague suggested that I check out this space. The site was indeed overgrown and abandoned. Once we discovered it was a Parks Department property, I contacted GreenThumb and we started the process of registering it as a garden. Crucial to this process was finding interested parents and colleagues who helped make connections and offer support to the garden. 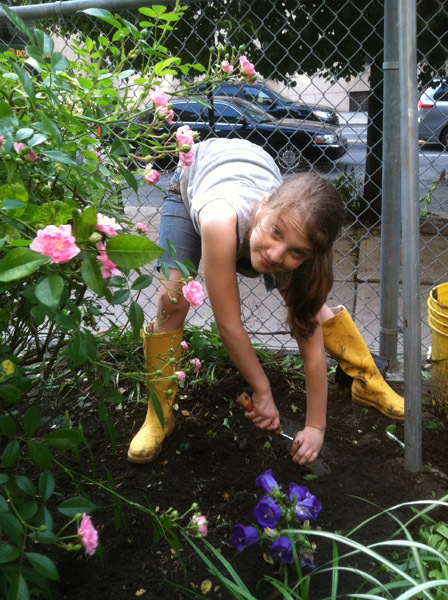 We received keys about a year later, in the spring of 2010.” Meredith and her students are so grateful for all the support they have received from GreenThumb and Grow to Learn as they have built and improved their garden. Now that the school year has begun, they will transition some of their beds into colder-weather crops, and hope to extend the growing season, thanks to new row-covers from a recent GreenThumb workshop! They plan to hold leaf raking parties in Morningside Park to stow away lots of brown material for their year of cafeteria compost. Meredith will incorporate the garden into her English class this year as a way to demonstrate how gardening supports the Common Core standards. Students are also enthusiastically planning a GreenThumb composting workshop for this October that will be led by 7th and 8th grade students. Keep a lookout in our October newsletter for the exact date, time, and location.